The second-generation Dodge Ram established the big, macho and iconic look that continues to define truck design today, and it pushed the truck segment beyond the boring and square sedan-inspired aesthetic for good. But it almost didn’t happen. The 1994 Dodge Ram was the result of a seven-year design process that went from unassuming to in-your-face. When it was introduced, Chrysler described the Ram as bold, aggressive, and “a real brute,” according to an article in the September 1993 issue of Car Styling. But the original 1986 design study was a laughably boring and bloated effort resembling a minivan. Named the “Louisville Slugger” by Chrysler’s Advanced Package Studio, the original design study serviced a modular platform for a full-size truck and full-size van, which resulted in a roomy cab and competitively large cargo bed, but left the design looking inoffensive and anonymous amid contemporary designs from other trucks on the market. Dodge clearly tipped too far towards “van” on the balancing scale. Despite generous dimensions and proportions, the Slugger’s packaging wasn’t even able to squeeze in Chrysler’s intercooled turbo diesel, nor its V10 engine from the Viper, which the company was later determined to offer. The project was abandoned in 1987 for trying to do “too much,” according to Car Styling. Chrysler was aware enough to realize basing a pickup truck on a van design wasn’t quite the punch they needed to throw. The result of the Phoenix project was another spacious, competitive-on-paper truck, but very clearly styled to be a Ford clone. This time they made sure it could fit Chrysler’s diesel and V10 engines, but that didn’t do a lot of good as the design was also scrapped in 1988. Chrysler only had six percent of the truck market at the time, and it couldn’t afford to produce a clone. It needed something original and opted to be bold. Seeking inspiration for this bolder look, the designers turned to the Dodge Power Wagon from World War II they came across in a book covering the history of American trucks, as well as examples of the big-rigs on the road at the time. It was fascinating to see just how much stuff was in there, how it wasn’t accommodated, how some had actually built their own wooden custom console units to hold cups, paperwork, clipboards, things like that. So we had some early research that indicated that storage in the cab was really important, and we were later able to confirm that. What resulted ultimately became the second-gen Ram—a truck initially bigger than its competitors with a look that featured a large rounded grille with headlights stretching away from the lower half, encased in defined fender flares stretching into an overall sleek profile. The pronounced grille and hood stretching out to the width of the truck clearly resembled the big trucks that inspired the design, and the look was a huge departure from the minivan shape that was originally considered. 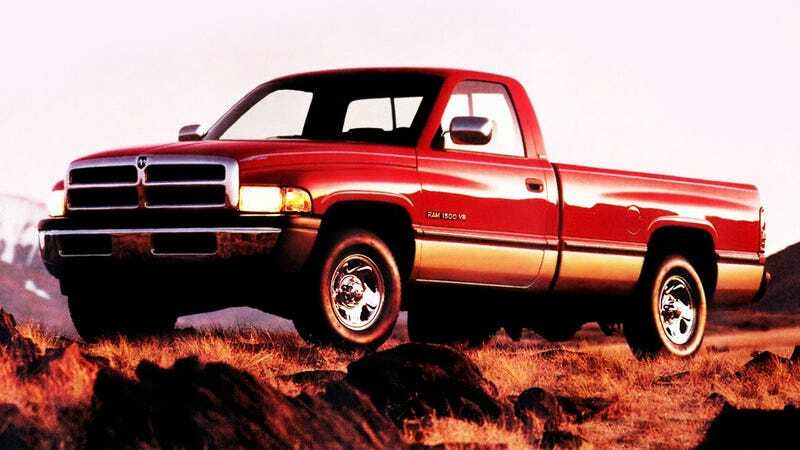 The design of the 1994 Ram changed trucks forever, as we’ve pointed out before. The pickup truck market embraced the Ram’s bulging muscular design treatment, and so became the requirement for trucks to have aggressive characterizations. Consumers responded too, with reported sales climbing from 95,542 in 1992 to a peak of 428,929 in 1999. Just imagine what would have happened if Chrysler went with the minivan look instead. Would we still have to deal with the aggressive shift in attitude of the truck market, and all of the coal-rolling, bro-lifts, hill jumps, and man-step hate that comes with it? We’ll never know.